I'm really not much into washing my face. It tends to make my skin worse and, truth be told, I just hate spending the time to do it. Until I started using these two cleansers by Bliss and Restorsea, that is. I've long been a fan of both the Bliss Triple Oxygen Instant Energizing Mask and the Triple Oxygen Treatment at Bliss spas. So is it really any wonder that I immediately gravitated toward this cleanser? I love that the liquid foams as you pump it into your hands (the bottle recommends three pumps for full face coverage). 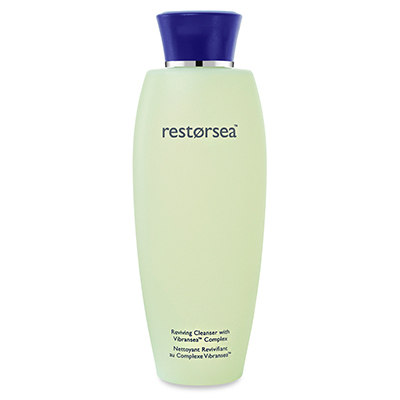 It cleanses the skin so easily and so deeply without feeling like it's stripping away anything necessary. Plus, it smells fresh and zesty thanks to the inclusion of Vitamin C! Want a cleanser that makes your skin feel fresh and clean in a snap? Enter Restorsea Reviving Cleanser. Formulated with Songyi Mushroom to lighten and brighten the skin, this cleanser just leaves behind such a gorgeous glow. My skin has been a bit drier than normal lately, and this cleanser brought back the moisture and hydration in a snap.